Already a print subscriber? Click here for FREE access to digital. $16.97 (plus $4 S&H) - a savings of 50% OFF the newsstand price! Plus, my 12 Quilting Guides will be instantly available for me to download and use today when I pay online. These exclusive guides are loaded with helpful hints and tips for mastering quilting techniques, time-saving secrets, and easy-to-follow "how-to" instruction suitable for any level. 2 years (12 issues) for $28.97 - Save 60% BEST DEAL! I understand that I will receive uninterrupted service and delivery of my magazine and that my subscription will be automatically renewed each year at the rate then in effect. I won't be bothered with any renewal notices in the mail; instead, I will receive a clearly marked annual reminder about 60 days before my credit card is charged or a bill is sent. 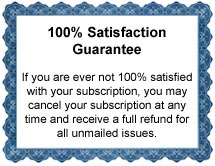 I may cancel at any time during my subscription and receive a refund on any unmailed issues by calling 888-985-1020 (U.S.), 1-386-597-4387 (Int'l), or visiting Subscriber Services. If giving a gift, this does not apply to your subscription or your gift subscription. 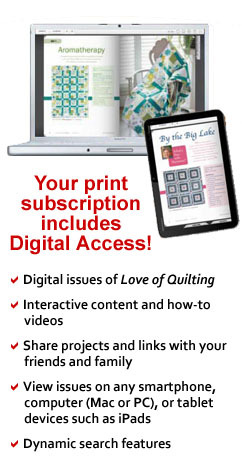 Love of Quilting magazine publishes 6 times a year. Savings based on an annual newsstand price of $41.94. © 2019 CRAFTS MEDIA, LLC. All rights reserved.